Mustafa arrived at the Central Mosque in Cologne on Tuesday to perform the Ramadan prayer called Teravih. He took the night off from driving taksi to attend the first Teravih prayer of Ramadan to get into spiritual mood of the holy month. His 8 year old son wanted to join as well but Mustafa refrained from bringing his boy along. It’s because authorities have arrested no one despite more than 50 mosques have been attacked in Germany this year which makes the members of the Muslim community feel extremely insecure. “The PKK/PYD terror groups might see the Ramadan crowd as an opportunity for fresh attacks. You never know. Since no one has been arrested despite 50 attacks, How do you expect me to bring my boy and feel safe. They (attackers) have thrown molotov bombs into some mosques for crying out loud,” said another man standing by who did not want his name to be mentioned. It is a common feeling among Muslim community in Germany. 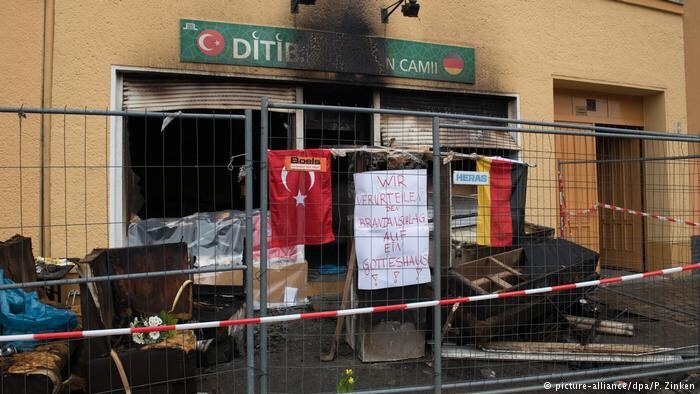 Central Mosque of Turkish-German Religious body, DITIB, was one of the mosques that was attacked by terrorist PKK/PYD supporters after Turkey started an operation in Afrin city of Syria to eliminate the fighters of PKK which is recognized as a terror group by Germany as well. Islamophobic and Xenophobic attacks from the far-right German groups have been increasing as well. Last year alone, German authorities registered almost one thousand Islamophobic attacks. Independent sources say the real number is much higher as most attacks are never reported. Despite constant attacks on Muslim communities, DITIB is extending olive branch to German society as a whole. DITIB will provide Iftar dinner for 30 thousand people at its headquarters in Cologne during the month of Ramadan. “We have Arabs, Turks and people from other Muslim countries. But also members of other religions will be joining to us during the month of Ramadan for our Iftar organization,” said the acting head of DITIB, Ahmet Dilek. There are some positive steps from the German side as well. Germany’s North Rhine Westphalia state premiership held an Iftar organization on Wednesday, a first of its kind. State premier Armin Laschet is dubbed Turkish Armin for his close relations with Turkish community. He attended the opening of a mosque in Aachen last week during which he said Islam is part of Germany.